Poll Results: Where Do You Work From? Nearly a third of CSS-Tricks readers work from home! Isn't that crazy? Well I was surprised, anyway. I know working from home is becoming more and more prevalent at companies. I bet a bunch of you are the freelancer types as well. But wow, a third, I never would have guessed that. Next up at 20% is an "open office" where you have a bunch of tables with computers and multiple people sit at them and work. That's what the SurveyMonkey office is like. Personally I'm moving from working at home into that environment. That's where the idea of the poll came from. 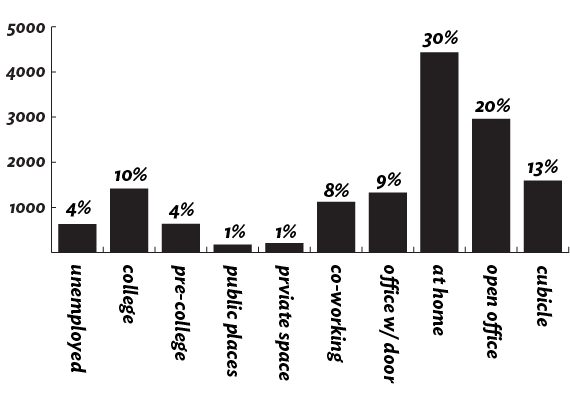 If you add up the open office, cubicle, and office with door numbers you get 42% - which is what I'd consider the traditional "go to work" crowd. I'm also surprised 8% are co-working. That's pretty cool, I thought that was a fairly niche idea even in our industry and that number shows otherwise. Sad face that 4% are unemployed. You should get a portfolio together and apply for stuff at Authentic Jobs. From what I hear everybody is hiring and it's kind of a workers market. I think it’s cool that there are 600+ kids in high school or less interested in web design. I’m a Freshman in HS. Yeah, I’m 15 as well. And at least 5 of us are fairly active readers it would seem (the four right here, plus Fordinary on the forums). I’m also 15 and a home-schooled high school sophomore. I suppose if “at home’ includes, “secret lair beneath volcano”…then yeah: understandable results. When I answered the poll, I was in a situation where I primarily worked from home, but since then I’ve got a client that has me run their restaurant for 7 days a week. I now kinda have to consider voting for co-working, although on paper it’s just another client from my company and I actually live above the restaurant. I guess I’m one of the in-between persons. I’ve worked from home as a designer/developer for the past three years, it has many advanatges. However one major drawback is being able to visit the fridge whenever I want to. On the plus side my clients say that it is a nice relaxed informal environment to meet for consultations. I love to work from home. Its nice to be able to take breaks when I don’t have a whole lot to do. If work is slow and your at an office, chances are your either going to be sitting there doing nothing, or surfing the net. I had never heard the term co-working.. I work from home but I can see the value of the co-working situation. I do not consider myself larger enough yet to warrant an office space but if you could get some non-competing like-minded people to go in together to buy/lease a space it might work. The problem for me was that I’m split 50/50 between working at an office with door and working from a home office. Can’t remember which I picked though. I’m kinda surprised that the numbers in the website design field aren’t more tilted toward the work-at-home. Both the traditional graphic designer/web designer and the multi tasking SEO designers could really benefit from leaving office politics behind and letting creativity flourish in a more peaceful atmosphere. i love working as a freelancer, but i also have a day job… am planning to switch to full time freelancer any time now! wow i am surprised that so many people work from home. that was the dream when i started web design, but then i soon had to whore myself out in rubbish places just to get by, and then i moved in to seo. oh well…. onwards & upwards guys! Hey I love to work as a designer. If you are a freelancer working in New York City, please visit my website http://www.guide4freelancers.com/ and add your favorite spots to work. Sometimes it’s a little too social for me to get much done, other times it’s very cool to see what others are working on.